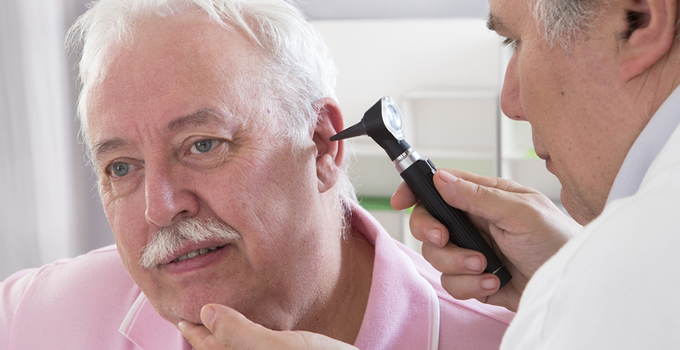 Dizziness or vertigo that occurs when exposed to loud noises or increased ear pressure. Some patients even experience a shifting of their visual field when sneezing, coughing, lifting heavy objects, or when exposed to loud noises. The effects typically resolve after a few seconds. A sensation that the ear is plugged or blocked and the symptom cannot be relieved by popping the ear. Autophony, which is the sensation of hearing your own voice in your ear. Hearing internal sounds, such as your heartbeat or the sound of your eyes moving. Hearing loss. In most cases, the hearing loss will be conductive in nature but can be mixed. A hearing test will typically show that the hearing in the inner ear is better than normal, but the hearing through the ear canal is diminished. The superior canal is the top-most canal of the inner ear. Pulsations and pressure can cause the bony portion of the canal to erode away gradually. This creates an outflow tract for the fluid compartments of the inner ear, which can cause hearing loss, dizziness, sound sensitivity, and vertigo. A cause of superior canal dehiscence is thought to be due to an increase in the intracranial pressure (fluid pressure of the brain). The standard for diagnosing superior canal dehiscence is a CT scan followed by a vestibular evoked myogenic potential (VEMP) test. It is crucial that the CT obtain scan slices under 1 mm in thickness to ensure accurate results. Scans of 1 mm thickness or larger may show a false positive for dehiscence. A VEMP assesses the balance organ of the ear. Sound is sent to the ear while the neck muscle is placed under tension. A VEMP result showing a decreased threshold and increased amplitude indicates superior canal dehiscence, especially when accompanied by a positive CT finding. Some patients choose not to seek treatment for their superior canal dehiscence. This may be appropriate for individuals who are relatively sedentary, aren’t bothered by the minor symptoms, and can easily avoid activities that can trigger the dizziness and vertigo. The middle fossa approach involves opening the skull above the ear in order to patch the hole in the superior ear canal. This procedure typically requires a two to four-day hospital stay. The transmastoid approach corrects the canal by going in from behind the ear. This technique is performed on an outpatient basis and does not require a hospital stay. A newer technique is known as round window plugging. This procedure involves going through the ear canal to plug one portion of the inner ear.